Style #748 Men's Retro [Men's 748 Retro] - $25.20 : Sogowear Outfitters!, Polo Shirts, Golf Shirts, Jackets, Fashion Fleece, Woven Shirts and More! A classic men’s short sleeve oxford dress shirt, combining the easy care of a 4.7 oz. 60% Cotton/ 40% Polyester blend, with a Teflon® fabric protector to resist stains. 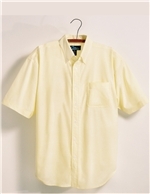 Features a button down collar, central pleated yoke back with loop and left chest pocket. Men's Sizes: XS, S, M, L, XL, 2XL, 3XL, 4XL, 5XL, 6XL, LT, XLT, 2XLT, 3XLT, 4XLT, 5XLT, 6XLT. Butter, French Blue, White, Light Blue, Dark Gray, Sand.